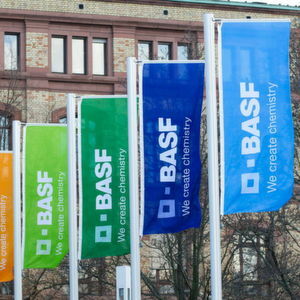 The new strategy announced by BASF is concentrating on organic business growth. With the aim of becoming faster and more flexible, the company intends to significantly simplify structures and processes, sharpen its portfolio and strengthen the Verbund. Sales with products that make a substantial contribution to sustainability are to reach $ 25 billion in 2025. Ludwigshafen/Germany — At the presentation of BASF’s new strategy in Ludwigshafen, the Chairman of the Board of Executive Directors Dr. Martin Brudermüller highlighted the positive developments in recent years. Since 2012, their income from operations before depreciation, amortization and special items has grown on average by 8 % per year, considerably faster than the 3 % increase in fixed costs per year. The group’s earnings growth thus also outpaced the 3.7 % annual increase in global chemical production. Moreover, there was strong development in free cash flow in recent years and a high return on capital employed (Roce), most recently 15.4 %. Above all, the new strategy aims to grow sales and volumes. The Asian market, where BASF is already well established, plays an important role in its growth strategy. With a world market share of more than 40 %, China is the largest chemical market and drives the growth of global chemical production. By 2030, China’s share of the market will increase to nearly 50 % and the company wants to participate in this growth, said Brudermüller. The new Verbund site in Zhanjiang in Guangdong province and the expansion of the site in Nanjing is to significantly enhance growth in this market. With its new strategy, the chemicals producer is pursuing ambitious targets — financial and non-financial. “We want to grow stronger than the market and we aim to grow our sales volumes above global chemical production growth,” said Chief Financial Officer and Vice Chairman of the Board of Executive Directors, Dr. Hans-Ulrich Engel. The company also wants to further increase profitability and targets an increase in Ebitda before special items of 3 % to 5 % per year. Furthermore, the group aims to achieve a return on capital employed well above the cost of capital percentage every year. To help achieve these ambitious targets, BASF is initiating a new excellence program which will run from 2019 until 2021. It targets annual earnings contributions of approx. $ 2.27 billion from the end of 2021 onwards. The program will include measures focused on production, logistics, research and development as well as digitalization and automation activities and organizational development. Additionally, the company commits to keeping its greenhouse gas emissions flat at the 2018 level until 2030 — even though they are targeting considerable annual production growth. According to Brudermüller, this means they will decouple their greenhouse gas emissions from organic growth. The target includes planned major investments, such as the new Verbund site in Guangdong province in southern China. To achieve this, the company wants to improve the management, efficiency and integration of its plants and, wherever possible, purchase a greater share of electricity from renewable energy sources. Brudermüller adds that this would require a suitable regulatory environment in Germany, Europe and around the world. In addition to the target of CO2-neutral growth until 2030, BASF wants to generate around $ 25 billion in sales with Accelerator products in 2025. These are products that make a substantial sustainability contribution in the value chain. “We want our customers to have a new experience with BASF,” said Brudermüller. Therefore, the company intends to further develop its organization so it can work more effectively and efficiently and be even more customer-centric. Combining the group’s expertise in the chemical industry with its customers’ competencies is to enable the development of solutions that are both profitable and responsible. To this end, the company is launching a series of measures which will, among other things, increase transparency for customers, enhance customer service and explore joint growth potential. BASF will concentrate on the following action areas: portfolio, people, innovation, sustainability, operations and digitalization.